Do You Know What is Firewall? 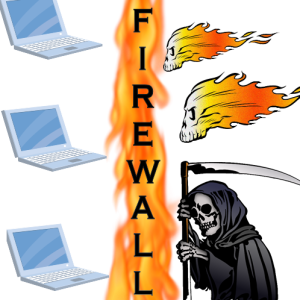 This article states the use of firewall for your security of your operating system from unwanted browsing sites .The firewall plays a vital role in maintaining security of your assets on computer. Have you ever noticed when u type domain www.facebook.com in your college, company or institute it is not available to intended user WHY the reason is administrator has hosted firewall for security. A firewall protects networked computers from intentional hostile intrusion that could compromise confidentially or result in data corruption or denial service .It may be a hardware device or a software program running on a secure host computer. In either case, it must have at least two network interfaces, one for the network it is intended to protect, and one for the network it is exposed to. A firewalls sits at the junction point or gateway between the two networks, usually a private network and a public network such as internet .The earliest firewalls were simply routers .The term firewall comes from the fact that by segmenting a network into different physical sub networks, they limited the damage that could spread from one subnet to another just like fire doors or firewalls. A firewall examines all traffic routed between the networks, otherwise it is stopped .A firewall filters both inbound and outbound traffic .it can also manage public access to private networked resources such as host applications. It can be used to log all attempts to enter the private network and trigger alarms when hostile or unauthorized entry is attempted. Firewalls can filter packets on their source and destination addresses and port numbers. This is known as address filtering .Firewalls can also filter specific types of network traffic. This is also known as protocol filtering because the decision to forward or reject traffic is dependent upon the protocol used, for example HTTP, FTP or Telnet. Firewalls can also filter traffic by packet attribute or state. A firewall cannot prevent individual user with modems from dialing into or out of the network, by the passing the firewall altogether. Employee misconduct or careleness cannot be controlled by the firewalls .Policies involving the use and misuse of passwords and user accounts must be strictly enforced these are management issues that should be raised during the planning of any security policy but that cannot be solved with firewalls alone. Anyone who is responsible for a private network that is connected to a public network needs firewall protection. Furthermore, anyone who connects so much as single computer to the internet via modem should have personal firewall software. How Does a Firewall Works? There are two access denial methodologies used by firewall. 2. Consequently, many LANS are now connected to the internet where internet connectivity world otherwise have been too great risk. 4. Privileges can be granted according to job description and need rather than on all or nothing basis.